Our Layover Day route to Smith Rocks and back offers super views at three overlooks, and lots of distant views of Cascade volcanoes. We start our day wandering across the broad flat Central Oregon plateau, in between giant crop circles where pivot wheels irrigate mint and alfalfa. This image provides an overview of the Day 5 route (purple line) and shows the three overlooks with superb views we will enjoy. Our first water stop of the day is the Round Butte overlook, which gives us a great view of Mt. Jefferson across the deep canyon of the Deschutes River, which is slowed in Lake Billy Chinook by the Round Butte Dam. Round Butte Dam plugs the Deschutes just downstream of its confluences with the Metolius and Crooked rivers, making a reservoir with three major arms and spectacular desert canyon walls. 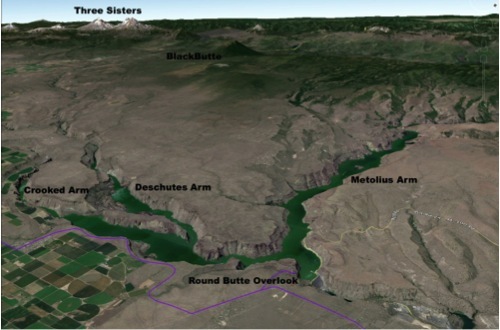 This image shows Lake Billy Chinook, formed by Round Butte Dam, which impounds the Deschutes, Crooked and Metolius rivers. We will see the Crooked River several times again today. In contrast to the Deschutes, which has a steady flow of cold clear water, the Crooked River has high spring flows during snowmelt and dies away to a trickle in late summer. The Metolius is a remarkable spring-fed river that bursts from the ground just north of Black Butte and immediately becomes a strong-flowing, cold and clear river. The Metolius River emerges from the ground at Metolius Springs. The dramatic rocky cliffs we see across the canyon are basalt and show typical columnar jointing. Basalt lava erupts at very high temperatures (2,200 degrees F) and is very fluid. The hot lava flows readily downhill, filling valleys and forming thick pools, which then cool slowly. As the rock cools, it shrinks and cracks. Under ideal conditions, the cracks take the form of hexagonal columns, though in most natural cliffs the columns are crude approximations of hexagons. As we proceed south along the rim of the canyon we will have more great views of Lake Billy Chinook, the distant Mt. Jefferson, and more dramatic columnar basalt cliffs. Don’t miss the turnouts that take you right to the edge of the canyon for more great views. We eventually leave the edge of the canyon and the lake and proceed through Culver and on to Highway 97. Our next water stop is where Highway 97 crosses the Crooked River Gorge, at the Peter Skene Ogden overlook. Once again we’re looking into a deep and narrow gorge, carved by the Crooked River into hard columnar-jointed basalt. This image of the Crooked River Gorge at the Peter Skene Ogden overlook is made from lidar point cloud data. Each colored dot is a lidar measurement point, and their color changes with elevation: blues are low, reds are high. Image by Dan Coe, from DOGAMI 2013 Lidar Illuminated Calendar. This basalt has a remarkable story. The lava in the Crooked River Gorge erupted about 350,000 years ago from Newberry volcano, which is by far the largest active volcano in Oregon. As you can see in the image below, the lava from Newberry volcano covers a huge area – far greater than all the Three Sisters volcanoes combined – yet few Oregonians even know of its existence. Unlike the steep snow-capped cones of the other famous Cascade volcanoes, Newberry volcano is a relatively low, broad, forested mountain, which has produced incredible amounts of fluid basalt lava. Here at the Crooked River Gorge, the lava has flowed 45 miles from the volcano. How did it get so far? A combination of very hot and fluid lava, and the tendency for basalt flows to follow existing valleys and canyons. What we’re looking at is a fine example of an intracanyon lava flow, which simply means that as the lava erupted it made its way into a river canyon, and flowed down the canyon for dozens of miles, ultimately filling the canyon with solid basalt rock. In this case, the poor little Crooked River has been forced to try to re-establish its former course by carving a new canyon through the solid lava plug. Notice how tiny the river looks at the bottom of the gorge – yet, in about 350,000 years it has managed to carve hundreds of feet into solid rock and has ground up and washed away an incredible amount of hard basalt. The dramatic lava flows at Round Butte overlook were also from Newberry volcano and had traveled over 60 miles from the volcano’s vent. 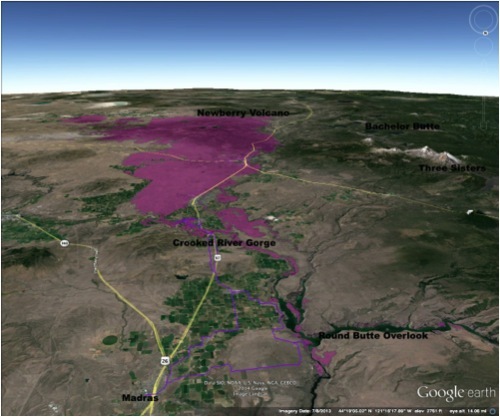 This image shows the extent of Newberry volcano and the far-traveled lava flows it produced. 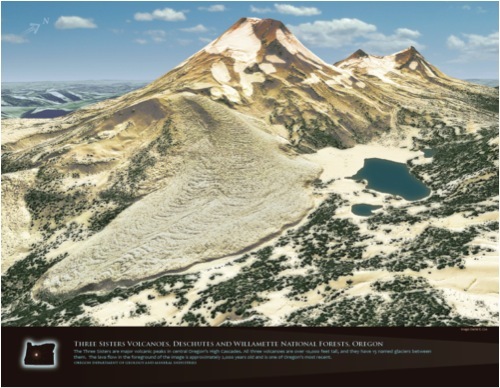 Newberry volcano covers 1,300 square miles, slightly larger than the state of Rhode Island. Notice its size in comparison to Mt. Jefferson or the Three Sisters. As we continue south from the Crooked River, we get better and better views of the Three Sisters. These three High Cascade volcanoes are dramatic cones, over 10,000 feet high, with year-round snow cover and small glaciers. The Sisters were built up by eruptions about 55,000 years ago, and have had several lava eruptions around their flanks since the end of the last ice age about 15,000 years ago, most recently at South Sister about 2,000 years ago. In 2001, scientists using satellite radar data detected a rapidly growing (1.5 to 2 inches per year) bulge in the landscape just west of South Sister. As volcanologists tracked the rising land over the next decade, the rate of growth slowed, but it is highly likely that the bulge occurred as fresh magma rose into the earth’s crust beneath the volcano, to be released in some future eruption. Lidar image of the Three Sisters viewed, from the south. 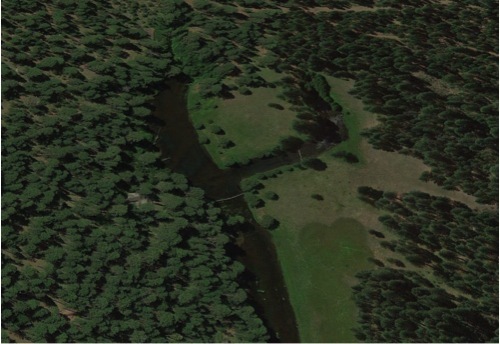 This image was created by draping an aerial photo over detailed lidar topography. The Middle Sister and North Sister have rocky summits sharpened to points by glacial erosion, but South Sister has a flat summit that hides a fresh crater. 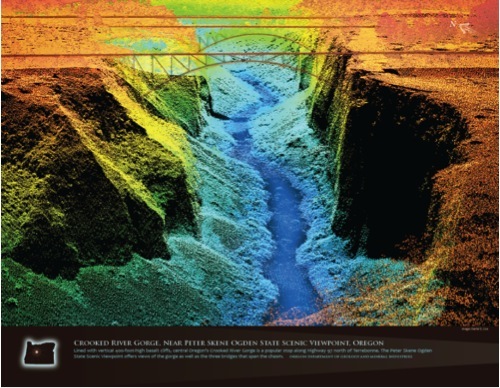 Image by Dan Coe, from DOGAMI 2013 Lidar Illuminated Calendar. When you arrive at the Smith Rock overlook you’ll see an obvious contrast between the dark columnar basalt on one side of the river and the dramatic tan and ochre spires on the other. We’re looking at two very different types of rock, both of which were erupted from very large volcanoes. The basalt is the same lava we saw at the last two overlooks, that far-traveled 350,000-year-old flow from Newberry volcano. Smith Rock are composed of welded ash-flow tuff that was erupted from the Crooked River caldera some 30 million years ago. A caldera is large volcano that erupts explosively, spewing massive amounts of frothy lava into the air. As the foamy lava hits the air, it cools into a volcanic glass sponge, or pumice, and the violence of the eruption shatters the pumice into a cloud of red hot ash and volcanic gas. Some of the ash rises into the stratosphere, where the jet stream can carry it around the world, but in truly large eruptions the rising column of ash collapses on itself and begins to flow across the landscape as a thick blanket of red-hot ash, burying everything in its way. If the ash layer is thick enough when it comes to rest, the remaining heat will be enough to cause the ash and pumice fragments to weld together to form a hard dense tuff like Smith Rock. Ash flows like this are known as glowing avalanches and can travel up to 100 miles at speeds of 40 to 50 miles per hour. 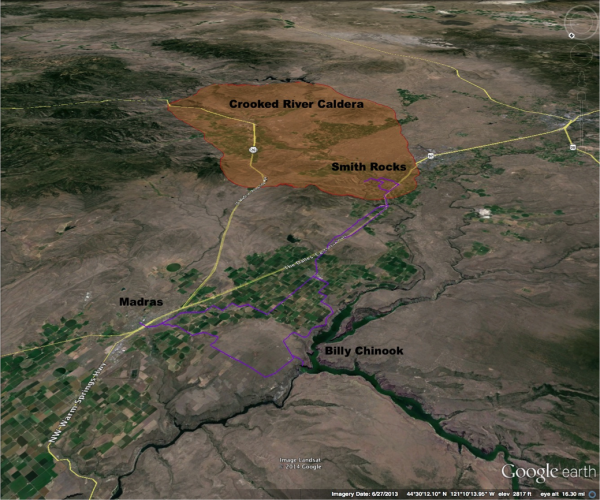 The image below shows the size of the Crooked River caldera, an oval depression 30 miles long and 17 miles wide. The caldera is filled with thousands of feet of the tuff we see at Smith Rock, a small part of the 140 cubic miles of ash that the Crooked River caldera spread across the landscape in a single eruption. A volcano this large is called a supervolcano, and the Crooked River caldera is among the 10 largest supervolcanoes known. The welded tuff is hard and dense, and has few and widely spaced fractures. This makes it ideal for rock climbers, providing secure hand and footholds on its vertical faces. That, along with the Central Oregon weather and brewpubs, makes Smith Rock a climber’s mecca. This image shows the size of the Crooked River caldera (orange tint). Our entire route today (purple line) would fit inside it.